Hatters boss Nathan Jones was raring to go once more after welcoming his squad back for pre-season training this morning. 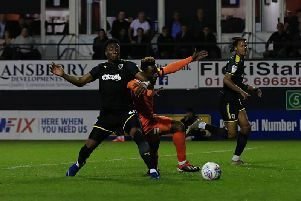 The Luton players went through fitness tests at the University of Bedfordshire before heading to the Brache to be put through their paces by the coaching staff. You’ve got to get fit, you’ve got to try and build your fitness up to give you something that will allow you to make it for the full season. On getting going once more, Jones said: “It’s been quite a long break. We’re delighted it was a long break and it wasn’t extended by any way, shape or form, but it’s a long time and you’re raring to go, once you’ve had your holiday and recharged your batteries. With Jones well known for his thorough attention to detail, then he already had the next five weeks planned out for his players. He continued: “Certain sessions change as we go on, we react to certain games, but everything’s done, especially the physical, or what type of session we’re doing, then details gets added as we go along. “For the next eight days, we’ve planned exactly what we’re doing, day in and day out, and then as we move into the trip (to Slovenia) and the games, then we tweak things accordingly. Jones did believe that the methods used has altered greatly since he was a player, saying: “It’s changed massively. “Look, the fundamentals are exactly the same, you’ve got to get fit, you’ve got to try and build your fitness up to give you something that will allow you to make it for the full season. “But it’s a lot more scientific now, a lot more structured in certain things, a lot less crazy runs and stuff. “We’re big on sports science here as a lot of clubs are and it‘s the right way. “I was a very fit individual, I loved just running, but I think if I’d had someone who was considerably more educated than myself, then it would have benefitted me. The Luton chief anticipated his players would be in fine fettle after their break too, adding: “We’ve got a very fit, professional group. “We did not so much warn them, but advise them to come back in exceptional shape and things have changed now, gone are the days when people use pre-season to lose a stone.